And what a sleepy little town it is. 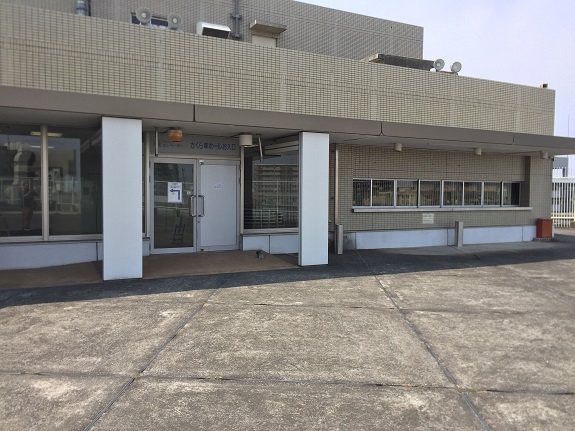 Sitting right next to the Japan Self Defense Force’s Iruma Airbase. I was slightly deceived by the presence of a McDonald’s inside the ticket gate (I don’t recall ever seeing one inside the gates before) a Dotour, and a connecting Prince Pepe mall. But once I got past the station entrance, this town was as quiet as they come. Barely anyone on the streets, not too many cars. It was actually kind of eerie. Eventually I got to the mall, and again…eerily silent. I knew the event was happening on the roof of the mall, so I took the escalators all the way up. I looked for the hall where the event was supposedly taking place, but I couldn’t find an open door, or for that matter any evidence of the event actually going on. Eventually I pulled on a seemingly locked door, which opened, and I could hear the faint sound of Koi no Owari Sangenjaya playing nearby. I had found it! By the way, it was really hot in the hall. People were fanning themselves, toweling themselves off. In fact Wasamin kept complaining about it as well. BTW, Wasamin has done so many of these kinds of events over the years, she couldn’t remember if she had ever performed at this mall before. (She hadn’t) She also noticed that when she sang Blue Light Yokohama, everyone with a lightstick switched it to blue. So it is her only non-A-side with an official glowstick color. 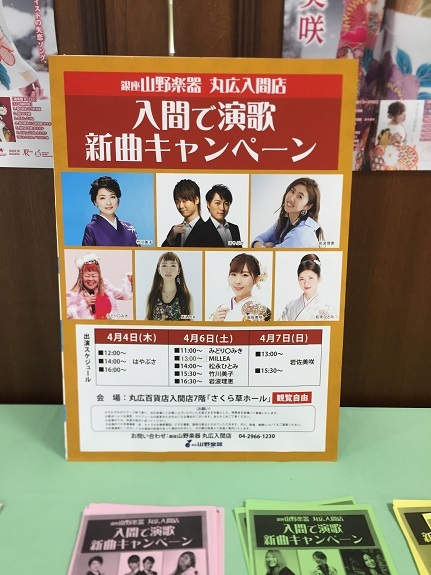 As for promotions, of course she was promoting her single, but she was also promoting the NagaraPro Suginami Ward concert this week, as well as her upcoming appearance on Utacon. I decided to only visit her once in the first live, and I chose the above pose because Wasamin kept making a gesture just like that during the show. She did it like 3-4 times, and she did it again in the second live. Of course I wanted to tell her about the article I wrote for the Japan Times. She asked if I talked about her in it. Of course I did! She wanted to see it, so I told her when I come back for my next 2-shot I would bring a copy. 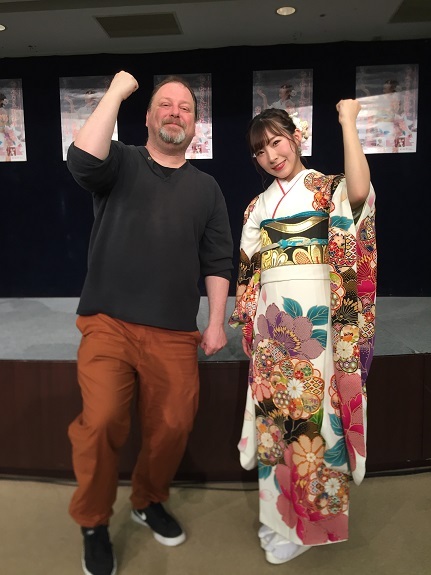 I also spoke briefly with Ichikawa-san, since Wasamin mentioned that she had tickets for the Nagara Group concert for sale. I asked how much they were, then told her I would think about it, and let her know after the second live. I had around 90 minutes to kill, so after sitting in a MosBurger for a while nibbling on french fries, I decided to take a walk around the neighborhood to look for a coffee shop, or just someplace to laze around. But all the malls were really strange, and there were no coffee places to be found at all. Then, it unexpectedly started raining. Well at least I was glad I didn’t hang any laundry this morning. I made my way back to Maruhiro to wait for the next event. I found an aisle seat in the third row, and spent my time talking to Shim-san while we waited for the event to start. Oh, Shim-san admitted to me that he reads my blog for English practice. Cool! 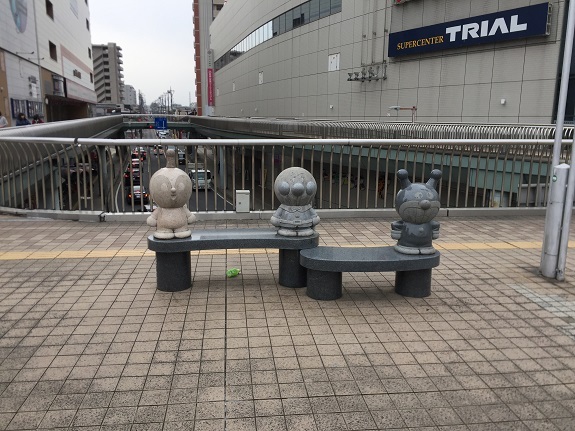 In addition to the promotions, and the fact that it was hot as hell in the venue, Wasamin brought up the film “Tonde Saitama,” which is a recent manga-based film which pokes fun at people who live in the surrounding prefectures of Tokyo, like Saitama and Chiba. The movie happens to star Gackt, and Paruru, among others. Wasamin was pointing out that like Saitama, her home prefecture of Chiba is treated much the same way. 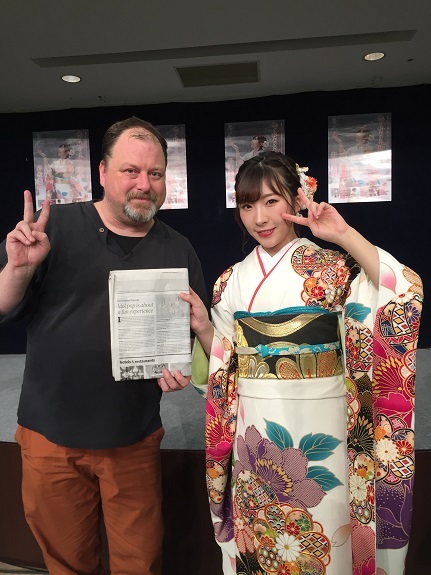 Once the live was over I bee-lined it to the handshake queue with my Japan Times copy in hand. I showed the paper to the staff beforehand so they wouldn’t worry it was something inappropriate. Wasamin began reading the article, and as I expected started calling out all the other groups I mentioned. Minyo Girls? KissBee??? (Wasamin has this “thing” about me liking KissBee) Festive??? Ahhh, Misaki Iwasa!!! She thanked me for showing it to her, at which point I told her she could keep it. I then decided to pick up the ticket for the Nagara Pro concert, and got the seat right next to Shim-san. For my second ticket I told Wasamin that I am going to be graduating from university very soon, that next week is my final week of classes, and the following week is exams. She wished me luck on my exams, and kept poking me in the belly during the entire handshake, LOL. And with that I took off. I ran into one of the other fans as I was walking out (I always forget his name) But I learned that he is a seiyuu, and is currently doing the voice of Cap’n Turbot for the Japanese dub of Paws Patrol, a Canadian cartoon. He also voiced the Vince Neil character on the Netflix film “The Dirt.” Anyway, I thought that was kinda neat. 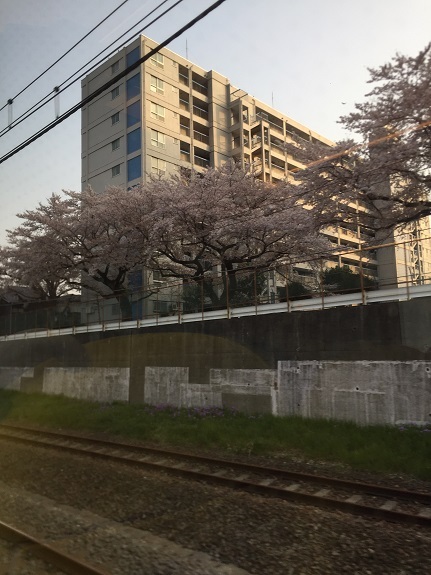 Sakura in full bloom along the side of the tracks! I headed back to the station, but I missed the Semi-express train by a minute, and would’ve had to wait around 15 minutes for the next train. That was unless I decided to catch the “Laview Limited Express Musashi”, which cost a bit extra, but only has one stop between Irumashi and Ikebukuro. I decided to splurge, and was treated to a luxurious ride back to Central Tokyo. Well, sorta luxurious, the exception being the screaming child in the row across from me. Annoying!